The MLB world is slowly waking up from its tryptphan-induced post-US Thanksgiving slumber, aaaaaand still not a whole lot is going on. That’s not terribly unusual for this time of year. When the Jays dealt for Josh Donaldson two years ago today, it was one of the earlier major moves of the off-season, for example. And this year the market is moving a bit more slowly than usual, largely because of the looming expiry of the current collective bargaining agreement between the league and the players’ association. With things like the luxury tax threshold going forward, and whether free agents next winter will have draft pick compensation attached, some of the biggest dominoes on the market are still standing, and that seems to be impacting everything else. This all should change in fairly short order, as the CBA is due to expire on December 1st, giving both sides a handy deadline to avoid the PR nightmare of a work-stoppage. The next day — this Friday, December 2nd — is the deadline for teams to tender contracts to their arbitration-eligible players, which will bring a new wave of small-tier free agents onto the market — something a team like the Blue Jays are likely watching closely, given their likely plans to spread money around rather than go after just one or two major pieces. And a week from today we’ll be in the full throes of the Winter Meetings [during which we’ll do some extra episodes of Birds All Day, just to make up for the ones we’ve missed of late, FYI]. To combat some of the bed-wetting that’s been going on over the lack of Blue Jays activity, Shi Davidi posted an excellent FAQ piece today at Sportsnet. But, much like I’m doing here myself, he might have buried the lede! I’ve said many times this winter, to the many people who’ve dismissively suggested to me that the new front office loves prospects so much that they wouldn’t even consider giving up a draft pick to sign a free agent, that maintaining their draft pick is surely part of the equation, but they’re not the whole equation. And while Davidi saying so certainly doesn’t prove that the Jays are willing to do it — they’d have to put their money where their mouth is for that — it really does only make sense that they would. You place a value on the pick that’s reflected in the amount you’re willing to offer the player. Just like I’m sure they did when they made their offer to Edwin Encarnacion, and just like they did when they weighed the pros and cons of giving a qualifying offer to Michael Saunders. 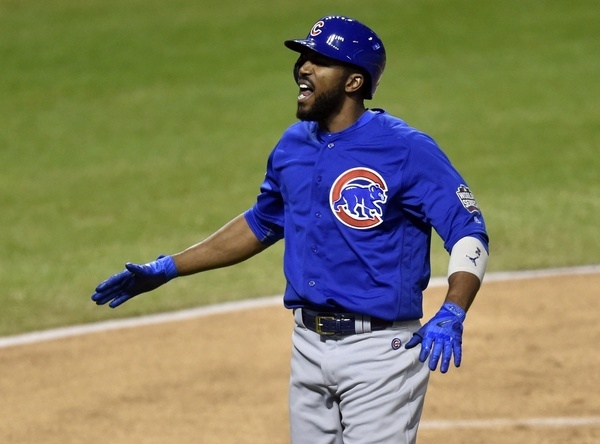 So why the hell don’t the Jays go out and sign Fowler already? Shi correctly explains that “he’s ideal for several other teams, too, which means the Blue Jays aren’t in the driver’s seat here.” And with some of the richer teams that may be looking at him still waiting to see where the luxury tax number is going to go, you understand why we maybe haven’t seen movement here as yet. In other words, as we’ve long expected, they’ll probably see their best path in opting for quantity over quality — for raising the floor of numerous roster spots rather than the ceiling of one or two. Hey, but maybe not! And no matter what, it seems like we’re at least going to find out soon what they’re actually going to be able to accomplish. Because make no mistake, it will be something. No need to get all sour about that yet! Jeez! More hints towards a Rogers sale of the Blue Jays?